The National Highway Traffic Safety Administration has launched a preliminary investigation into the electronic power assist steering system in the 2011 Ford Explorer over a handful of complaints about the steering system failing to provide proper assistance to the driver. The National Highway Traffic Safety Administration decided to open the investigation into the electronic power assist steering system of the 2011 Ford Explorer after the federal agency received 15 complaints of the steering system randomly failing while being driven. In some of these 15 cases, the power steering system began working as expected when the driver shut the vehicle off and restarted it but in other cases; once the power steering system stopped working, it would not regain normal function. 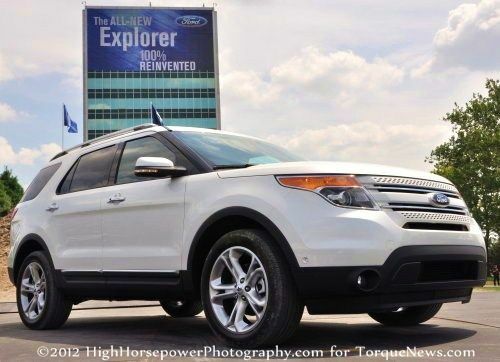 This investigation includes roughly 83,000 units from the 2011 model year Explorer. The 15 owners who filed complaints about their electronic power assist steering failures in the 2011 Ford Explorer stated that when the assist system stopped working properly, it got very difficult to turn the steering wheel. One owner went so far as to say that when the EPAS system failed, the steering wheel pulled away from her husband’s hands and it was impossible for him to move the turn the vehicle. That failure came at low speed so no other damage was done. In addition to the steering wheel becoming impossible to move, the particular owner stated that the warning message “Power Assist Failure” appeared in the driver information center. Luckily, in the 15 complaints filed with the NHTSA with the problematic power steering system in the 2011 Ford Explorer, there have been no reports of accidents or injuries resulting from the steering system failure. Like many modern vehicles, the 2011 Ford Explorer is equipped with the high tech electronic power assist steering system rather than a fluid driven system that is run off of the engine via a drive (or serpentine) belt. The main advantage of the electronic power steering system is that it does not present the draw on the engine that the traditional power steering system does so when removing this addition effort from the engine – vehicles equipped with this system can put more power to the wheels while also offering better fuel economy. The other big advantage of the electronic power assist steering system is that it allows more adjustments and tuning, features which are especially helpful in the higher performance models that pack a similar system like the 2013 Ford Mustang. The downside to the electronic power assist steering system in the 2011 Ford Explorer (as it displayed by this new NHTSA investigation) is that this system is fairly new and new technology always has a greater potential for “bugs”. A great many vehicles sold in the US offer electronic power steering rather than the traditional belt driven system and there have been very few complaints across the industry as a whole. With just 15 complaints out of more than 83,000 units sold, this is clearly a very small sample section of the 2011 Explorer SUVs but with the possibility of a vehicle suddenly becoming impossible to control – it leaves to question as to why the NHTSA is looking more closely to see if there is an issue with the electronic power assist system. The other day my EPAS system failed causing my steering wheel to lock as I was turning left in the middle on an intersection. I was able to pull my wheel as hard as possible and get to the side of the road. I turned the vehicle off and restarted it and the vehicle was operable again. The next day, I took it to the dealership where not one person had heard about this problem. I then got a call today being told that it could take 2 weeks to 3 months for an entirely new assembly rack to be received from Ford! Needless to say, I'm kind of concerned for anyone else out there that may have the potential for the same problem. Ford needs to act immediately on this problem! My Power steering suddenly stopped working while driving down the high way. Driving down the highway and my steering system just locked up while turning left of an exit. It took all my strength to make the turn and pull off the road. I have also lost steering in my Explorer a number of times !! I have been on major highways but thank god neither myself or my children have been injured! ! I will never purchase a ford again!! Nothing but problems!!!! Our 2011 Ford exploder... Lol has done the same thing to my wife. Just to let everyone know , at almost 100,000 miles on it and it's the p/s has been making a errrrrr sound when turning the wheel. Now with that said with the power steering being electronic if the alternator starts to go bad it will adversley affect the p/s. I am in process of replacing the alternator and already ordered the e/p/s hard ware. All relatively easy to change. Oh and I'm a GMC guy all the way but this explorer has been great it loves the snow and ice handles like a sports car and seets an entire 7 person family comfterbly great on gas and love the features loaded of corse. So all and all I'll fix these two problems cause it's not that hard too and do a software update. New things have bugs to work out and those two things are a lot better than the GMC Chevrolet recalls with the ignition systems and what not. So, is this a recall item by Ford? I have a 2011 Ford Explorer and am having problems with my power steering. At times it male functions and I am unable to drive my vehicle. I had the same problem with my 2011 Explorer. I took it to the local Ford Dealershipand they repaired it at NO COST, to me. Suggest you take and see if they are willing to do the same for your problem. My 2011 Explorer is doing the same thing, I was turning off an exit and lost all power steering. I was driving on frwy and power steering svc light came on at same time trac adv lightcame on i was closer to a jiffy lube (within minutes it was completely impossible to turn the wheel) than dealership and pulled in to have them check it they said it had to be done by dealership as it was electronic. It took two grown men and myself to turn the steering wheel just enough to back it out of the bay and into the lot. My concern is what if i had been driving with grandbabies in the car and it went out at a higher rate of speed. It couldve been disastrous . and eat about this trac adv light ?? How does that affect the steering as well? My 2011 explorer started experiencing power steering problems that would not allow the wheel to turn at all when leaving the parking lot. Had to turn the car on and off a few times to get it to work. Over time it happened more frequently and while the car was in motion. Last one was when pulling into driveway and had to pull in sideways. Nothing I do no fixes the issues the power steering and advanced steering control lights are on. It's unusable I'll have to have it towed. It's dangerous what if I were on the highway with my kids? Same thing as everyone else commented. Pulling off of the highway and got a power steering fault and trac failure alert and could not move the steering wheel. Called my local ford dealer and they installed all recalled parts and service free of charge.